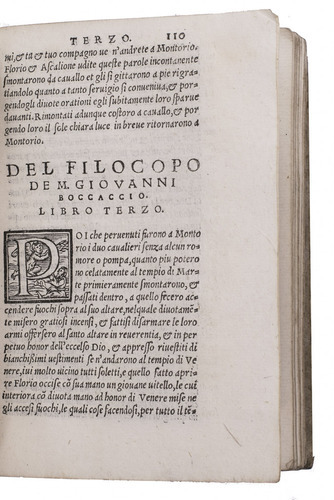 Second Sansovino edition of Boccaccio's first important work, Il Filocolo (here Filocopo), a prose romance written ca. 1334-1336, about twenty years before the Decameron. Boccaccio reworked the 12th-century French love story of Floire (Florio), muslim Prince of Andalusia, and Blancheflor (Biancifiore), the orphaned daughter of his mother's Roman Christian lady-in-waiting. They grow up together in the royal household, but when they fall in love his parents try to break up the romance by selling her to merchants who will take her to Alexandria to join a harem. Florio, under the pseudonym Filocopo, rescues and marries her. He converts to Christianity and they return home where he ascends the throne and his people embrace Christianity. Boccaccio introduced many new elements into the story and told it with his usual flare for (often risqué) humour. It served as inspiration for writers around the world from Chaucer to Keats, and Boccaccio himself further developed several episodes for stories in his Decameron. 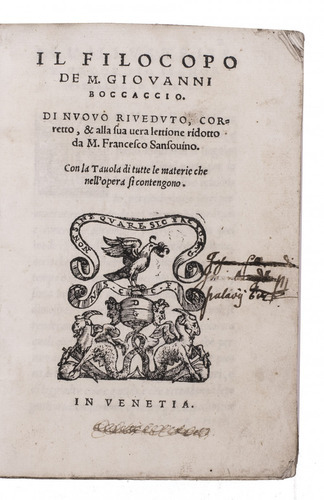 Francesco Sansovino (1521-1583) had produced the first variorum edition of the Decameron in 1546 and then turned his editorial scholarship to Il Filocolo, beginning with Gaetano's text (editions in 1527 and 1538). With 2 early owners' inscriptions on the title-page, both struck through and part of one abraded. 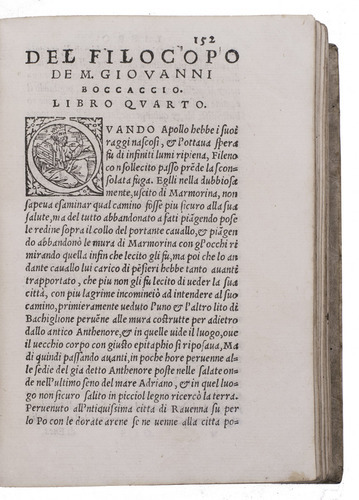 With a small hole in the title-page and the corners of a few leaves dog-eared, but otherwise internally in very good condition. The binding is worn, but the lovely manuscript title on the spine remains clear. 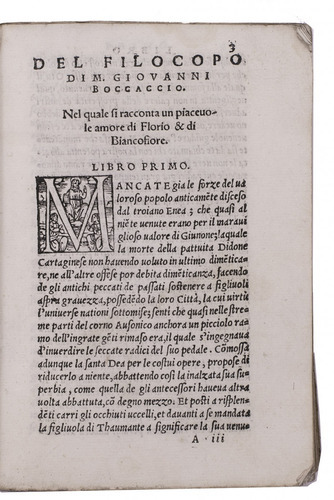 Second edition of the best Renaissance redaction of Boccaccio's important, influential and entertaining first major work. EDIT 16, 6334; Gay & Lemonnyer, col. 726; USTC 814845; cf. 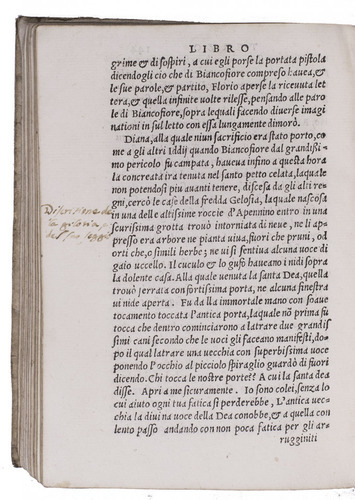 Gamba, Italiana letteratura 198 cr. (other eds. 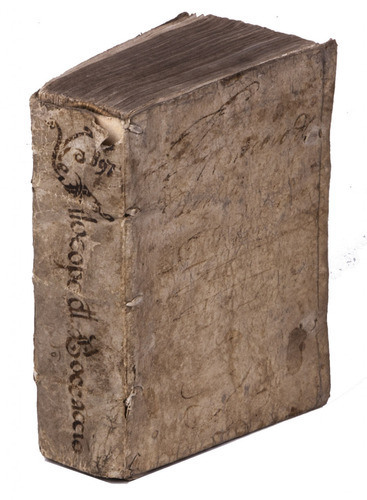 ); for the text: Kirkham et al., eds., Boccaccio: a critical guide, pp. 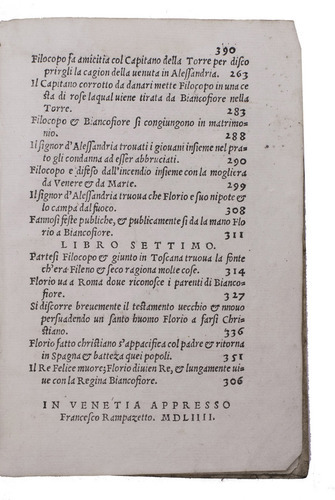 87-93; Marrone, Encyclopedia of Italian literary studies, pp. 252-253.